A man who murdered his teenage girlfriend before burying her body in a park has been jailed for a minimum of 20 years. John Davis, 26, carried out a "brutal and sustained assault" on Hazel North at his flat in Kilmarnock in March. He then buried her body in a shallow grave in the town's Dean Park. Hazel, from Dunfermline, was reported missing by her family three weeks before her body was found. Passing sentence at the High Court in Glasgow, judge Lady Rae told Davis: "You destroyed a young woman's life in her prime and caused indescribable pain to her family." She described the murder as "wholly motiveless". The judge gave Davis a life sentence with a minimum period of 20 years before he will be eligible for parole. Ms North's family - including parents Rosina and Graeme - were in court to see Davis being sentenced. In a statement outside court, her brother Michael North said he was "delighted" that "such an evil individual has been removed from society". He added: "Nothing will bring Hazel back. We would ask people to remember Hazel for who she was and her beautiful smile and not the tragedy that ended her life." During a hearing at the court on Tuesday, Davis had admitted murdering Ms North in March. The court heard the teenager may have lay dying for up to 18 hours. Davis, who had only recently been released from prison after carrying out an assault using a golf club. then hid her remains in the park. He later told a friend: "I done her in and buried her". Police launched a major search operation after Hazel was reported missing by relatives. Detectives quickly had suspicions about Davis, but were unable to contact him. It later emerged he had fled the country in a failed bid to join the French Foreign Legion. He eventually turned up at Kilmarnock police station, where he told officers: "Hazel is dead and I'll show you where she is." Davis took officers to Dean Park, pointed to the ground and said: "She is in there." He added: "This is helping me. I realise what I did was wrong and I'll face the music from here." Ms North's naked corpse, which had been wrapped in a sheet and a curtain, was discovered in what was described as a "reasonably well concealed grave". She had died after suffering severe blunt force trauma to her head, neck and body. Her injuries included massive bruising and multiple fractures to the jaw and eye socket and 14 fractures of the ribs. The court heard it was the pathologists' opinion that the head and neck injuries "suggested a survival rate of at least 16-18 hours" after they were sustained. 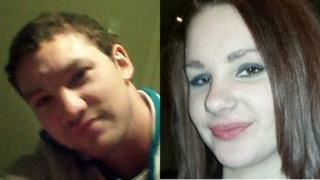 Prosecutor David Nicolson told how Hazel had started dating Davis in May 2012 after meeting in Stranraer. The relationship was described as "on-off" at the time of the murder. Davis's lawyer Simon Gilbride said: "Why he did what he did that day, he does not really know." Mr Gilbride added: "He does recall that it was 9 March she died. "After that happened he panicked and disposed of the body. He then effectively ran away. "He could not come to terms with the gravity of the situation."